"I was brought this product as a Christmas present, 3 weeks later and I have an awesome supply of herbs. Easy to use and the herbs are full of flavour and smell. I struggled to grow herbs outside and took too much effort and when they did grow the bugs ate them. No bugs inside. Love this product." "Have had my Urbipod since last April and absolutely love it; I have 8 pods which I rotate. I love having fresh herbs on hand - as well as saving me a run to the shops, it also saves us money." "Highly recommend Urbipod. I have never been able to grow anything but with Urbipod I have and it’s so easy. I have been enjoying fresh herbs since September last year." "The UrbiPod initially sparked my interest because I love cooking and using fresh ingredients but I would buy herbs, they would sit in my fridge and I would forget about them, then have to throw them out. Growing herbs outside meant that the bugs would eat them and I forgot about them. 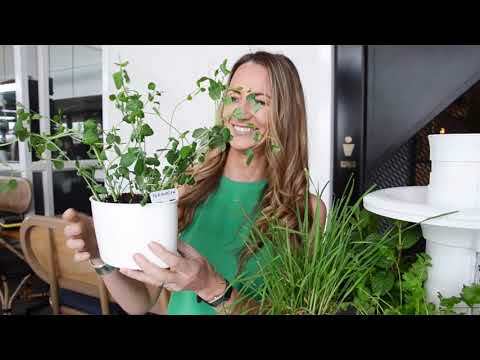 Having herbs in a stylish, self-maintained (I don’t do much) system means I use them regularly without waste, so it is better for our hip pocket and the environment. The best part is my minimal effort in equals maximum crop out and I can now grow coriander! My family are also really excited to see the changes each day and now ask for herbs in their food too." "I absolutely love having an Urbipod in my Home Ec classroom. It means that not only do the students have access to fresh herbs each lesson, but they can also see what is required in order for plants to grow. We have been sharing our Urbipod with the Pre primary students and they have had lots of fun watching the plants grow, eating and cooking with the herbs." "I absolutely love my UrbiPod as it has given me a renewed opportunity to grow my own herbs at 84 years young! Given the severe arthritis in my hands, I had to give up my love for growing largescale in my backyard – now the herbs I love are growing on my kitchen Bench right in my reach. Parsley, 2 pods of basil (my favourite) and now experimenting with miniature tomatoes (they are beginning to fruit) - Always available! Delicioso! That is Italian for Delicious." We love everything botanical, and we want to share that with you. Take a look at our blog where we discuss everything from Alfalfa to Zeodary. For example, did you know the Ancient Egyptians used Basil as a part of the embalming process, and has been used in medicine in India for thousands of years?